With the Dekranger/Gavan Space Squad movie on the horizon, we recently took a 2nd look back at S.H. Figuarts Deka Red. So while we were at it we figured it was time for a full gallery of the original Metal Hero himself, with S.H. Figuarts Space Sheriff Gavan! For a little background, Space Sheriff Gavan (Uchuu Keiji Gavan) was the inaugural series in Toei's Metal Hero franchise, the third of the big 3 Toei Tokusatsu franchises. The series debuted in 1982 and began with Retsu Ichijoji (Gavan) being dispatched by the Galactic Union Police in order to save Earth from the evil Don Horror and the Makuu Space Mafia. His adventures on Earth spanned 44 episodes and inspired the long tradition of Metal Hero's who succeeded him, including his 2 immediate successors who also bore the Space Sheriff title (Sharivan & Shaider). As well as his eventual modern replacement Gavan Type G. Type G would debut in 2011's Space Sheriff Gavan the Movie, and would even be followed up by modern updates to both Sharivan & Shaider. Obviously, Metal Heroes are undergoing somewhat of a renaissance in recent years. With S.H. Figuarts for shows like Juspion, Juuko B-Fighter, & Tokkei Winspector having been released in the last 2 years. Then there's a Premium Bandai Ranger Key Set, and even a 1:1 scale roleplay toy for Gavan. 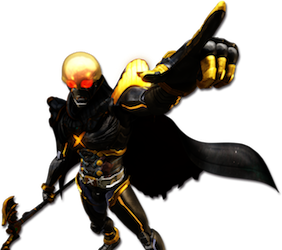 This is sort of the Golden Age for Metal Heroes. With all that in mind, as well as the recently announced Gavan Renewal Figuart coming our way, we figured it was well past time to take a look at the original S.H. Figuarts Gavan! The original Gavan packaging is actually pretty great. It's got some interesting detailing that really gives you a feel for the show and character. The later release, Gavan Type G, uses the same style of box with some swapped colors to differentiate, but really they're both pretty lovely. I don't know why but on occasion I'm kind of a sucker for cool packaging, in Gavan's case it just works for me. Now first to get things out of the way, there is an S.H. Figuarts Gavan Renewal on the way, as recently revealed by Tamashii Nations. And I've had this original release ever since it first came out. Well I just can't properly express how excited I am by the prospect of the new figure. That's primarily because the original is such a flawed release. Read below to find out why. For starters Gavan actually really does look quite good out of the box. At first glance the chrome looks great, his proportions seem solid, and he manages to look a little less goofy than the actual show suit itself does from time to time. However on closer inspection the flaws begin to become clear. Starting with the chrome I mentioned, this was a bold choice by Tamashii Nations. Chrome has been used sparingly through out the S.H. Figuarts toyline but this is one of very few figures which is covered in it. And frankly it isn't entirely accurate. I get that they were going for the more striking look of Gavan, but reflective chrome just isn't what Gavan had all the time. He was often shown in more of a brushed silver. Silver armor with reflective aspects was used in appropriate scenes, but I always preferred the muted look of silver or gray to chrome. So I'm kind of 50/50 on the chrome. But the chrome on this figure is also very easy to flake, and applied inconsistently. It doesn't help that it's a finger print magnet as well. Looking at the feet, these were poorly designed in the first place. The ankle cuffs restrict nearly all movement so creating dynamic poses is very difficult. The cuffs also aggravate the chrome flaking. The way in which the hips impact the waist joint/diaper allows chrome to flake off there most easily. While we're on them the hips are also notoriously loose on most Gavan's The plastic used is the same weak type the wrist pegs were designed with (we'll get to that). So the hips themselves can crack internally and loosen over time, mine are quite bad at this point. The chest and torso details are actually quite nice, as are the arms. On the arms here comes the standard warning about the horrendously designed wrist pegs. They were constructed with paper thin plastic pegs that leave them extremely prone to breakage. Just be careful, and forgive me for not displaying Gavan with too many hands in the gallery. I couldn't bare to break another one. The arms themselves are limited by the shoulder design, the chrome shoulder pad impacts the joint itself making it hard to move his arms properly, they also tend to flake pretty badly over time. They got all the broad strokes of Gavan's detailing down pat on the torso and abs. But weirdly the lower torso section is on some strange angling joint that lets you lift up and pull out on the body, exposing a massive gap around his back when you do so. It looks very unnatural, not pleasing to the eye at all, and really it doesn't even facilitate that much more movement out of him. The head however is a dead ringer for the real deal, as is the swap out head described in the accessories section. If not for the flaws present in this design, Gavan could have been wonderful. As a huge fan of Metal Heroes I'm really quite disappointed that this is how the figuart turned out. I'm certain that the renewal will fix all of these issues and add some much needed proportionality to the design. As is this original figuart is somehow an even worse figure than the much older Toei Action Works release which was the standard for some time. Even the much older Souchaku Henshin release has more going for it than the figuart. It's just flawed in every aspect. 3 - sets of additional hands. Just the usual stuff, some open palms, some sword holding hands, and some pointing type fingers for Gavan's Laser Z Beam. Please be cautious, when exchanging hands on this figuart they are very easily prone to breakage. The wrist pegs snap clean off the ball joint quite easily. Years ago I broke my original Gavan this way and wound up buying another eventually. Just be careful, this design flaw is one of the primary reasons a renewal figuart is happening. 1 - Laser Scope head. This alternate head replicates Gavan's visor lighting up as it does periodically. Originally an ability meant to allow Gavan to detect invisible monsters, it's since become synonymous with moments of power or showy flashy action. It's my preferred way to display this figure actually. 1 - Laser Blade. The standard weapon of both Gavan & Gavan Type G, the Laser Blade is a fairly basic but ornate weapon. The hilt will just barely fit down into the sword holding hand that Gavan includes. 1 - Laser Blade Slash Effect Version. This version of the sword replaces the blade with a curved sweeping effect to replicate Gavan's finisher the Gavan Dynamic. I know that seems like a lot, but there are a couple of omissions that bug me. First, you do get the Laser Blade & slashing version. But there's no "powering up" version. When Gavan runs his fingers along the edge of the blade it glows as he does so. Even the much much older Toei Action Works Gavan included this version of the blade. In fact that figure included a total of 4 versions of the blade. The other thing that bothers me is that no more effect parts were included. Gavan is famous for having a number of special abilities that could easily benefit from dedicated effect parts, but none exist for him. It's still a good selection, just a little off. I love Metal Heroes, absolutely, positively. 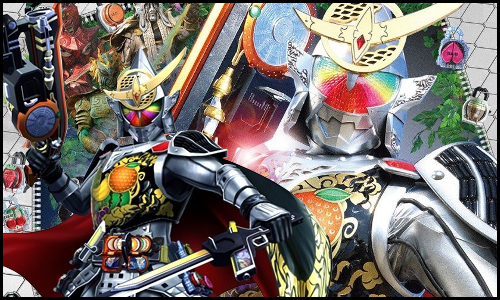 They consist of some of my all time favorite hero designs and series in general when it comes to tokusatsu. Sadly the original S.H. Figuarts Gavan never quite lived up to expectation. It's riddled with design flaws and QC issues that made it a huge disappointment when I picked it up at initial release. I sincerely hope the Renewal figuart can avoid the issues the original was plagued with. I'd love to have a truly great figure of Gavan in my collection. When that release comes out, please be sure to check back here for a full gallery of it! Last edited by Den-O; 12-29-2016 at 11:58 AM.. Damn, I never knew how many issues this figure has. I haven’t read up on it before because Metal Heroes isn't really my thing but this had to be a big bummer for Gavan fans. Hopefully the new figure holds up better. This figure looks pretty good though, I like the sword slash effect and that they included a second head with the eyes lit up. Amazing gallery. I love the shiny chrome on this guy, though the way the "body" is sculpted seems a little off to me. The joints are very obvious and seem out of place in comparison to other SHF figures I've seen. But I'm guess this is an older figure and that probably explains this? That aside, the effect parts are amazing! That looks like it is worth the price of admission. I wish I had the money to drop on these guys. The only SHF figures I have are Ichigou, V3, Leangle, and Koyru Red. And V3 is the only one I actually bought my self, the rest were given to me. I do still really like my Gavan figure, but you're right on the money with the issues. Especially the finger print thing, keeping him clean is a pain. Yeesh, this figure sounds like a mess. I do kind of like the chrome look of it though. It's such a shame to hear how flawed the original release is, especially because Gavan is one of my favorite Toku Designs. Good to hear there is a renewal version on the way though. Urgh, I'll never forget the day mine broke Those scrawny wrist pegs are the bane of my life. If I only I could get a hold of the new one without having to grab the bike at the same time. I like the chrome too bad it has so many issues. Very slick. I like it.